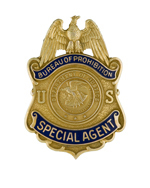 Prohibition Agent John Gilbert Finiello and other agents were serving a Federal search warrant on the Rising Sun Brewery in Elizabeth, NJ. After arresting several still hands, the agents were surprised by members of the Mickey Duffy mob, who held them at gunpoint. Members of the gang made specific comments about "Finiello" and then purposely shot and killed him. Two of the men responsible for Agent Finiello's murder, Albert Silverberg and John Newman were never tried in New Jersey courts because of witness identification problems. However, in 1932, both men were convicted of murder and sentenced to life imprisonment on an unrelated liquor case in St. Paul, MN. 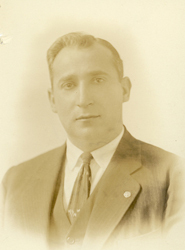 Agent Finiello joined the Prohibition Unit on January 9, 1926, with an annual salary of $1,860. He carried badge #2284. Several days after Agent Finiello's death, the Bureau received an anonymous letter mentioning the Finiello shooting and threatening the life of other prohibition agents, "if they continued to pursue and arrest bootleggers." This letter is displayed at the end of this file and is also part of the History exhibit. Agent Finiello was born in La Morra, Italy. He was survived by his wife, Margaret and a son, John, Jr. In May 2003, Agent Finiello was posthumously honored by the Federal Law Enforcement Foundation of New York at their annual "Heroes Night." In attendance that evening as VIP guests were John Finiello, Jr., his wife Charlene, Andrea Finiello and other family members.